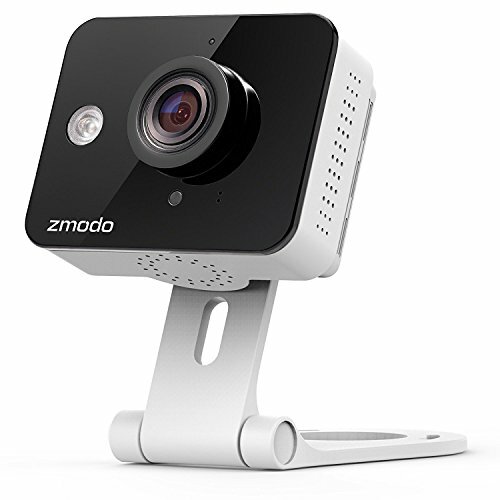 Overview: The Zmodo Mini Wi-Fi Camera offers you an easy way to check in on home while you’re away. With motion detection alerts, on demand remote viewing, two-way audio, and night vision, the Mini Wi-Fi Camera is the easy and simple way to protect your home. Features:720p HD Camera - The camera’s wide angle 115 Degree field of view lets you see more of your space. With automatic IR night vision, see up to 16ft away in the dark. Simple setup - Connect your Mini Wi-Fi Camera to your home’s Wi-Fi with Smart Link, our easiest setup method yet. Just enter your Wi-Fi password, and your camera will connect automatically. Free mobile app - Easily connect to your home network with our free application, and view and control your camera from anywhere on your smartphone. Log into your account on your web browser at user to view your camera from a computer. Motion detection alerts - The Zmodo Mini Wi-Fi Camera will alert you on your smartphone when motion is detected. Easily set up alert schedules in the app to decide when to receive alerts and when to enable quiet hours. Two-way talk- Built-in mic and speaker allows you to talk to someone at the location of the camera and hear their replies. Great for checking in on your children or talking to your pets. Sharing - share your camera with your family member’s accounts. Easily enable and revoke sharing access as needed. Smartphone or Tablet Required for Setup and Operation (iOS 7 and newer or Android 4.0 and newer)Specifications 720p HD Video Mobile Push Alerts Two-way Audio Indoor Only One LED Array for up to 16ft of Night Vision Built-in IR Cut feature 115 Degree Field of View Smartphone or tablet required for setup and open Wired Power DC 5V 1.5A Micro USB2.0 Note: Issue in connecting the camera or viewing remotely, first confirm if WiFi network meets the camera’s requirements as stated in the listing and on the packaging. 720p HD Non-Stop Monitoring - See crystal clear and detailed images of your home anywhere and anytime. You can turn on, off, or adjust the sensitivity of your night-vision so that you can obtain the perfect picture of your home, day or night. Additional Free Services - This product also includes a 60-day return policy, 2-year Zmodo warranty, lifetime tech support by phone, or 24⁄7 Live Chat with a real Zmodo representative. Easy and Quick Setup - Turn on the camera and complete the network configuration in just minutes. Connectivity: IP/Network-2.4GHz Wireless (Incompatible with 5GHz). Please contact Zmodo Europe for connection questions. Zmodo Cloud Service - Motion alert clips are saved in the cloud for 36 hours for free. All users are also eligible for a 30-day free trial of our 7 day cloud recording plan. Paid cloud recording plans for storing 24⁄7 footage are available in 7 and 30 day plans. With the plan, you can review, save, and share footage at any time, and reduce false alerts with cloud intelligence.